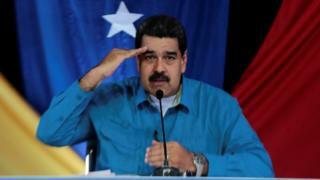 Venezuela's President Nicolas Maduro has ordered a 60% increase in the country's minimum wage, effective from Monday. Including food subsidies, the worst-paid workers will now take home about 200,000 bolivars a month - less than $50 (£38) at the black market rate. The pay rise is the third this year from Mr Maduro, and aims to benefit government workers and the military. Demonstrators first took to the streets on 1 April to demand elections, after the courts tried to strengthen the president's grip on power. What is life like in Venezuela? Observers fear 1 May could bring a spike in unrest, with opposition and pro-government supporters planning rival marches. Pope Francis has offered to mediate between the Maduro government and its opponents, but the opposition has rejected the overture. Its leaders say the president has installed a dictatorship, and blame him for Venezuela's economic crisis. Even a 60% pay rise may come as scant consolation to millions of the country's workers, whose buying power has been damaged by a stricken currency. Critics say the move will merely fuel the country's runaway inflation rate. Venezuela has one of the world's highest inflation rates, which could hit 720% this year according to the International Monetary Fund. 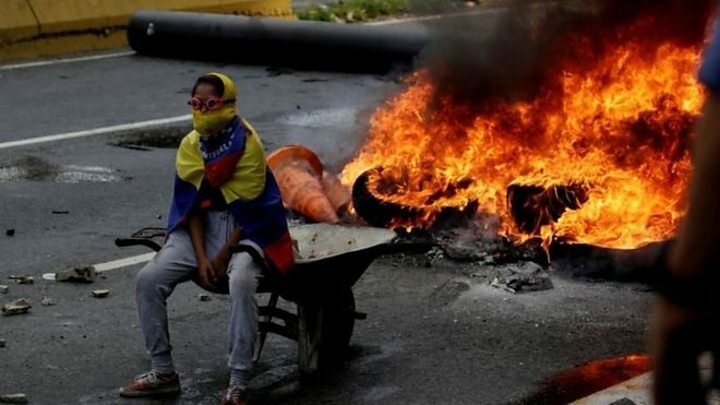 Even residents of traditionally pro-Maduro districts have been joining the protests against him in recent days. "I have been a month now joining in all the protests because I want my country to be free of this dictatorship," said 42-year-old Yoleida Viloria, a hairdresser from the capital, Caracas.